Motorola is releasing this beaty very soon! Somehow it reminds me very much of the Google G1. A bit sharper edges and stuff but that seems to be “in” right now. Therefore, most specs are the same with one highlight: the screen resolution will be 854 x 480 pixels. That sounds pretty nice to me! Moreover, Motorola put a capacitive 3.7 inch display in there which means the display definitely supports multi-touch. Micro-SD, Bluetooth, WiFi, GPS, 5 MP auto-focus camera with double-flash. The US CDMA model will be available for $200 with a 2-year contract on Verizon. Check out the Droid does website. By the way, I found that note on Golem. ← Android SDK 2.0 has arrived! 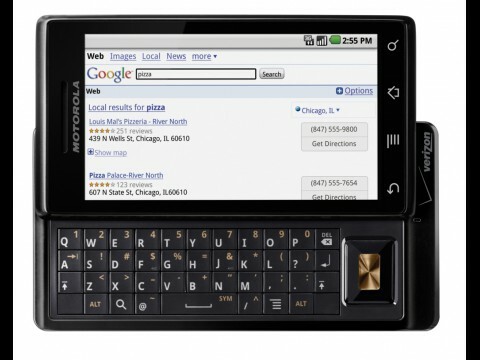 I really like the design of the Motorola Droid. Got mine about 2 days ago. Love the alarm clock feature with the dock station. Hope they make a new version without the keyboard so it can be thinner. The digital keyboard is good enoug for me. Navigation is really fast thanks to Android 2.0. Typing is kinda hard on the keyboard because of the 4 way navigation pad that is in the way. Nah, whatever I think the Droid is awesome and can easily take the iPhone.